Those of us working in community colleges have long assumed that higher education propels students of modest means into the middle class and reduces income inequality. In short, affordable, accessible higher education grows the economy and strengthens our democracy. Now a new report entitled “The Uneducated American” from Georgetown University’s Center on Education and the Workforce provide the data that back up these understandings. Demonstrated by the increasing pay gap between high school and college grads, this report shows that our economy suffers because insufficient numbers of US citizens are achieving college degrees. If we increase the number of college grads, the authors argue, two things will happen: everyone's income (and the US economy) will go up and the income of HS grads will go up faster thus reducing income in-equality. I encourage you to read the report at the link The Uneducated American . 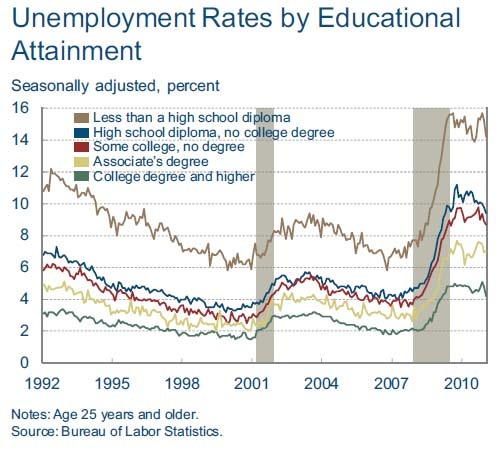 To demonstrate that higher education is still of great value, even during the Great Recession, look at the chart below that shows unemployment by educational attainment. ( Chart from NY Times, 3/11/11).